В стране, где лето длится долгие годы, а зимы десятилетиями, девять великих домов сражаются за контроль над семью королевствами Вестероса. Возьмите под свой контроль благородный дом, от Старков из Винтерфелла до Ланнистеров в Утёсе Кастерли и заполучите железный трон! - Traditional dynastic claims are now handled by Bloodlines, and can emerge dynamically once a dynasty has held a title for 7 rulers. - Added new mechanics for Norvos. 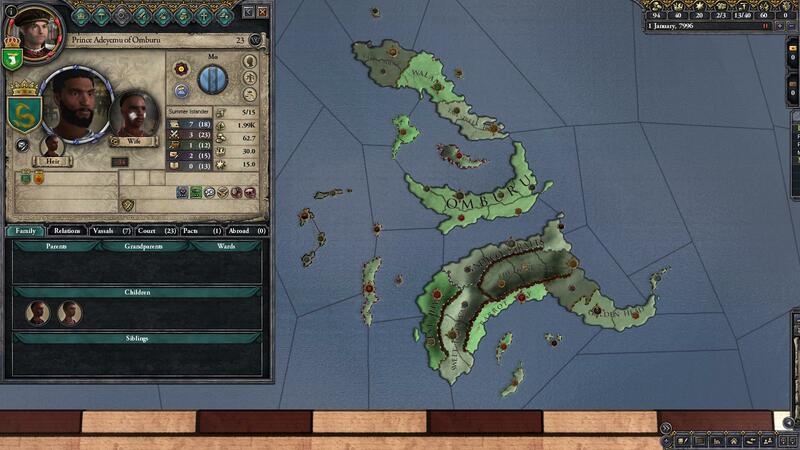 The Monastic government now uses a system of Monastic Order dynasties, where you play as an order rather than a familial bloodline. Plus other flavour events. - Added the Grey King's father (ID=750064) as a means of connection for house Goodbrother and the Grey King. 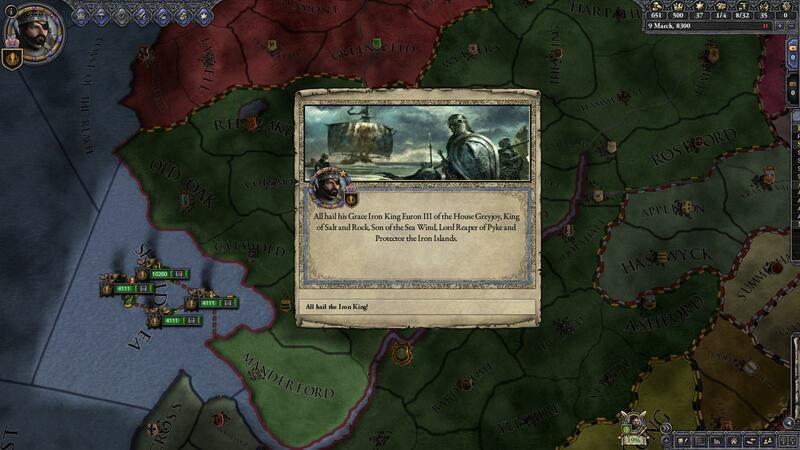 - Changed the birth date of the Grey King from 1.1.1 to 1.1.2, and increased lifespan by 7 years as he is stated to have ruled the iron islands for 1007 years. - Added the progenitor of house Goodbrother - brother of the Grey King (ID=750065). - Added the line of the Goodbrother to link to Urrathon Badbrother and future Goodbrothers. (ID=550111). - Removed the line of the Grey King (ID=751066), replaced with Grey Urragon - Eldest son of the Grey King (ID=750067) and linked to house Greyiron with a line(ID=751067). 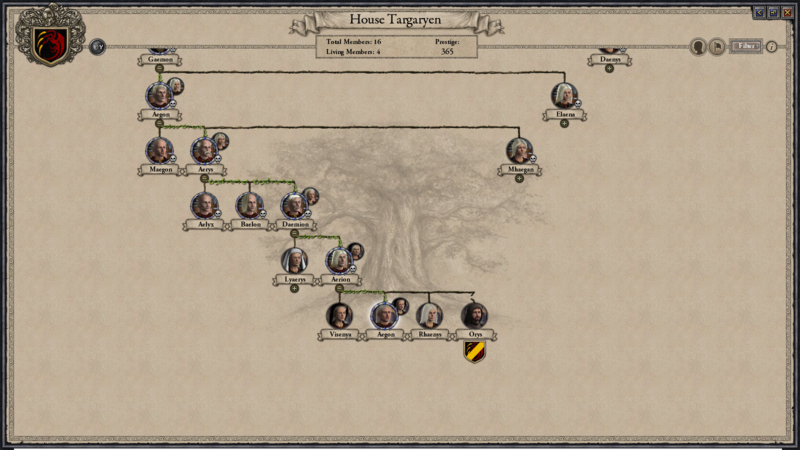 - Added Torgon the Terrible as a son of the Grey King (ID=750068) - ancestor to the Hoares, and his line (ID=751068). 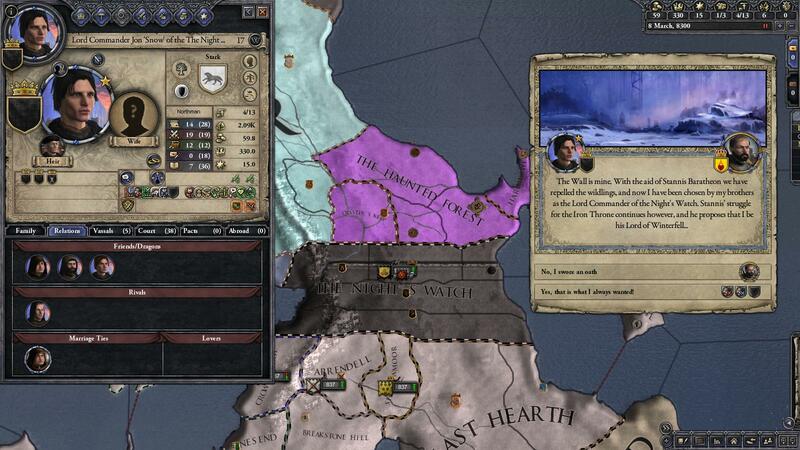 - Added Hrothgar of Pyke as a son of the Grey King (ID=750069) - ancestor to the Greyjoys and his line (ID=751069). - Added the quick trait to Dalton the Red Kraken (ID=20107). - Added the reaver trait to Dagon the Last Reaver (ID=18107) in 211 AC. 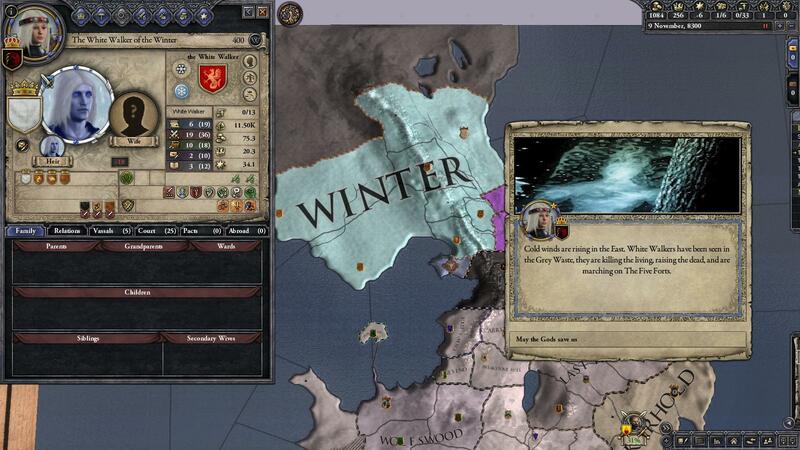 - Changed name of Lord Wex of Blacktyde (ID=3014118) to Garmon and his birth date to 118 AC.Deleted his lowborn wife Jonella (ID=5014118) replaced with Gudrun Greyjoy (ID=5014118) daughter of Vickon II Greyjoy. She is now the mother of his son who has had his name changed to Andrick (ID=3017118). 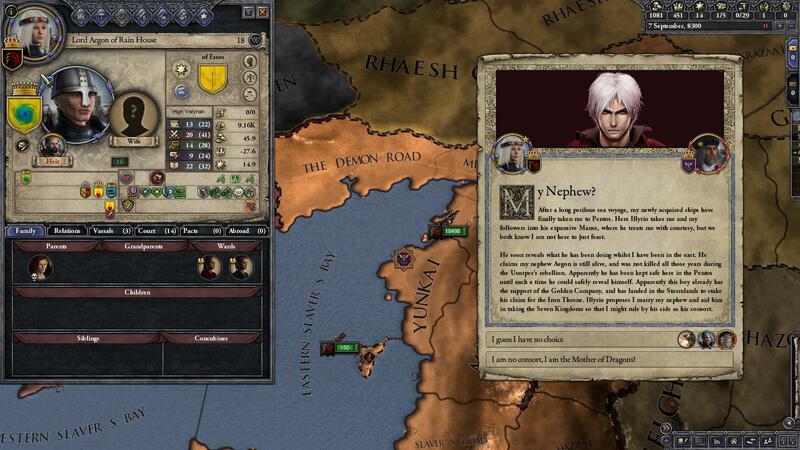 - Changed the birthdate of the sea dragon Nagga from 1.1.1 to 1.1.3 so that the Grey King's father could be added. - Added Qhored Hoare and House Justman as playable characters at the start of Rhoynish Wars. Ironborn at the peak of their power under Qhored at this time. - Added fine armor artifact for Jason Mallister to represent his Hand's Tourney indigo-silver armor. - Fixed Sar Mell not being a ruin when it should be. - The Household Guard is now represented by a building in the capital holding. The AI can now also build this building. Added some canon Household Guards to some houses. 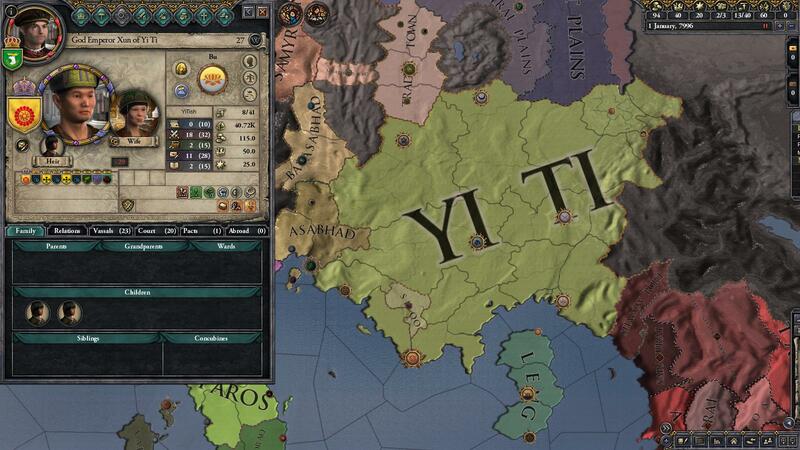 - Improved the landless dynasty nickname system. Made it possible for generic nicknames to occur, also added Dayne and Celtigar nicknames. - Fear from cruel executions now only applies to vassals or family, as with the base fear for execution. Also applied it to crucifixion. - Slave raids now target an entire realm, rather than individual provinces. The location for sacking and gaining of slaves is now randomly selected from occupied provinces. - It is now not so easy for the player to get guardians in not so realistic places. 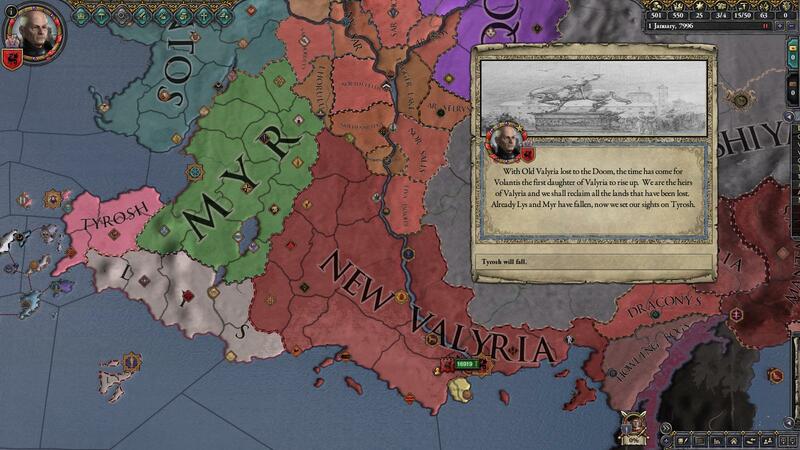 there may now be a cost or opinion malus with vassals. - Patient and zealous traits are now valid traits to claim dawn. Also added an event informing the player when someone claims dawn. 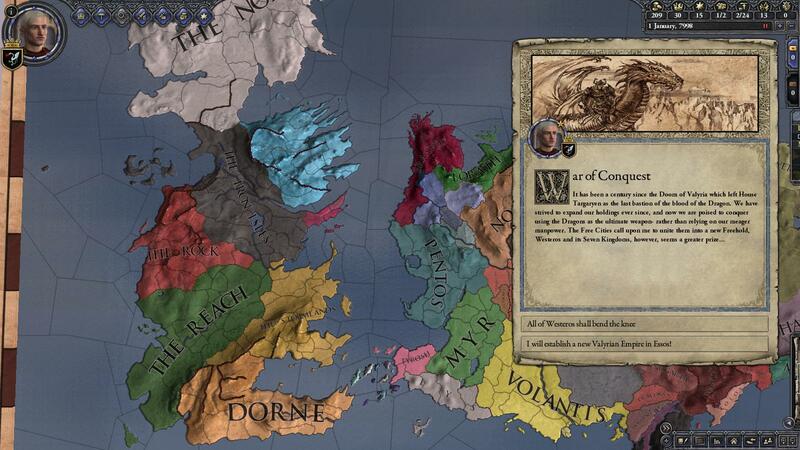 - Made some tweaks to the revoke vassal title plot, including the option to depose liege if the vassal wins the war. - Extended the Sarne to the Silver Sea. It is now also navigable by all. - Added in title loc for e_dawn so it now displays "The Great Pearl Emperor" instead of "God Emperor Pearl Emperor"
- The Reapers DLC compatible: enjoy new death and disease opportunities! - Learning skill of recruited physicians lessened to better match recruited maesters. Also lowered learning thresholds in treatment events. 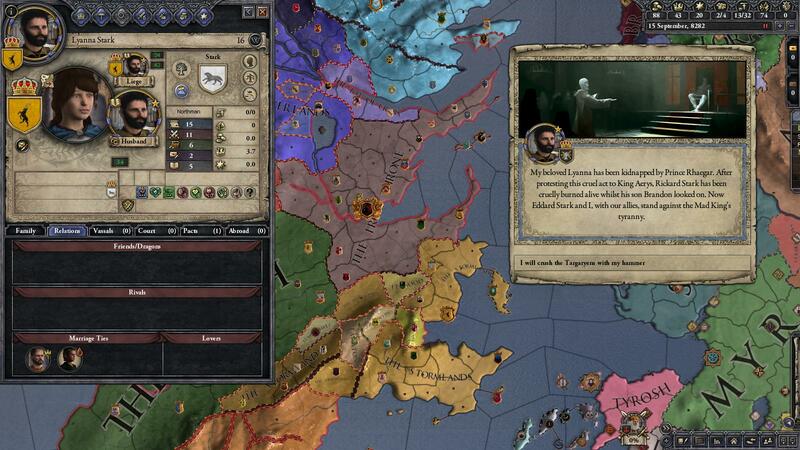 - Grey Plague is now much more deadly, and gives scarred by greyscale trait if survived. Characters who have had greyscale/grey plague before are now also immune to both. - Warlock healing now uses the same system as Rhllor healing. Healing is now also more difficult when dragons aren't around and magic is less powerful. - Bearded Priests now have beards. Мод переносит игроков в восхитительный мир Вестероса, написанный Дж. Мартином в книжном цикле Песнь Льда и Пламени.Игроку представится возможность сыграть за один из великих или малых домов, либо за Ночной дозор, правда, в настоящий момент готов лишь один сценарий — Восстание Роберта Баратеона, поэтому вряд ли вам захочется играть за Дозор и быть в стороне от главного конфликта. Перед разработчиками стояла непростая задача учесть все те детали, которые отличают Семь королевств от средневековой Европы. Это потребовало не только заново локализовать игру, но и включить десятки персонажей (и в перспективе — всех, кого Джордж Мартин упомянул на страницах саги), адаптировать сценарии. Конечно, пока речь идет лишь о бете, сценарий и описания еще не следуют точно букве книги. Например, чтобы исключить случайный набор характеристик Тириона, его пришлось сделать взрослым уже на момент восстания Роберта. Установка[spoiler]Распакуйте архив в директорию игры, подтвердите замену файлов. И да, на какую версию устанавляваете? 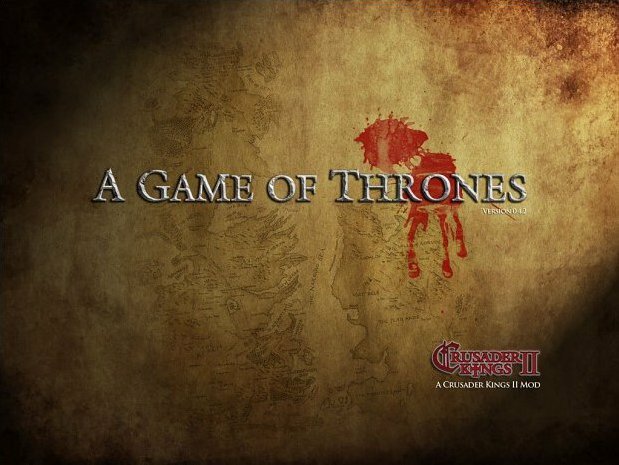 ссылку заменил, спасибо за "звонок"
Вышла новая версия мода Crusader Kings 2: A Game of Thrones 0.5 , исправлено множество мелких ошибок, основные нововведения - добавлен континент Эссос, добавлена работорговля.